Justin Bieber does has a soft corner, he made a visit to the young victims of Typhoon Haiyan on Tuesday. He traveled to Philippines on his first visit in his worldwide campaign to help those affected by the Typhoon Haiyan. He first flew to Tacloban from Australia. Tacloban is the devastated capital of central Leyte province. 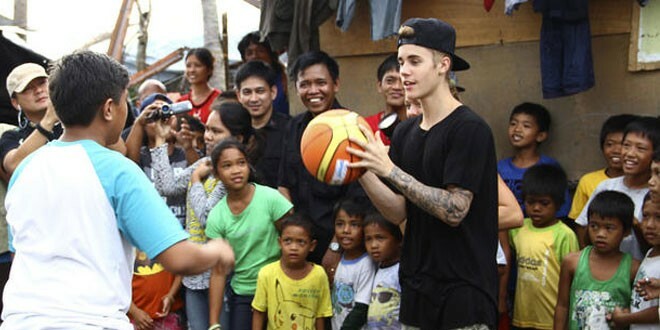 Justin Bieber distributed shirts, toys and basketballs to children. The 19-year-old pop star visited a Tacloban elementary school that is being used as an evacuation center despite being heavily damaged by last month’s typhoon, which left nearly 6,000 people dead and more than 1,700 others missing, and flattened entire towns and villages in the central Philippines. “It was like we were not hit by the typhoon, like Yolanda never came,” one girl told Manila’s TV5 Television, describing her feelings on seeing her idol. Typhoon Haiyan is known locally as Yolanda. Bieber took a quick walk around the school and checked a temporary learning space that was packed with about 300 children, including some from the local neighborhood, before moving to an outdoor stage to sing, said Kate Donovan, a spokeswoman for UNICEF. At another school also used as temporary shelter, Bieber played basketball with some boys and posed gamely for pictures with his fans. “Justin brought a lot of joy, hope and cheer to the hundreds of children who were there,” Angela Kearney, UNICEF’s emergency coordinator for Haiyan response, said in a statement. 'Breaking Bad' finale gets record-breaking 10.3M views! Previous: Lea Michele’s “Cannonball” Preview – LISTEN!